Following up to this, churches need to watch their Leases and Lease Provisions very closely. These are long-term deals, usually around 25 years in duration. Chances that the cell tower lease will outlive you. You don’t want to be remembered as the minister who got us that horrible cell tower deal. On average, when we look at the typical Verizon Wireless, AT&T or T-Mobile lease, there are about a dozen items in that (or any) cell tower lease agreement that need to be added, removed or adjusted. The tax language is one of them alluded to in my 2009 article. Cities and municipalities are constantly looking for ways to generate more revenue. A few years back, Tower Genius got a call from the city of Salt Lake City, Utah and they wanted to hire us to help them come up with a way to tax cell tower landlords. We turned them down of course, but let’s be honest, not everyone in government likes churches, and if they can figure out a way to make you pay, they will. I can’t stress this point enough to be shrewd when dealing with a cell tower proposal. Sadly we can’t how many times we’ve seen the slick heavy-handed tactics used against churches. Don’t let the carriers bully their way into your church. Period. Jesus would probably throw them out and overturn their tables. Sadly we see churches getting taken advantage of every month without fail. I’ve seen several recent examples where carrier site acquisition reps are not willing to work in good faith with churches to find the best location for the tower with minimal impact to the church’s future expansion plans. We’ve also seen examples where churches sold off their lease revenue stream and were left with a large annual property tax bill and nothing to show for it, and also saw many examples of heavy handed negotiating tactics when dealing with churches. Our opinion is, do not be yoked with these sorts of arrangements. Just say no. It’s better not to do the deal. The million-dollar question is, what is your church’s cell tower lease worth? As a rule of thumb, if you have tough zoning codes and plenty of progressive NIMBY neighbors (tree huggers, and granola people) living in your community, the cell tower rents generated will tend to be higher. So, if your church is contacted about a cell tower, you have a lot to think about. Namely, what to do next? Is the lease rate they are proposing a fair price? Generally the initial offer is not the best. What impact will this have on our members or the community? What type of tower or cell site are they proposing? More importantly, is it worth encumbering your church property for the price they are asking? If they are proposing a camouflaged or stealth concealed design as a church steeple cell site or a bell tower, these are generally more expensive to build and are reflective of a tower zoning ordinance for the carriers to develop sites that blend in. This should generally translate into a better rental price. Don’t be fooled by carriers, tower companies or other cell tower consultants providing you with a database of cell tower lease rates. Every site’s valuation is 100% specific to the neighborhood, coverage area, zoning requirements, topography and availability of competing sites. Your location might only be worth $500/month to the carrier “take it or leave it”, or they may pay $2,500 / month or more depending on the location. If the carriers have other choices besides your church property, they have the ability to negotiate a lower price with your neighbors. If they have limited choices, this can benefit your church. Also, dealing directly with Verizon, Sprint, U.S. Cellular, AT&T, Telus, Rogers, Bell Mobility or T-Mobile is not the same as dealing with American Tower, Crown Castle, SBA Communications (the big Wall Street tower companies), or even dealing with the dozens of small, local tower developers. Carriers sell voice and data plans. Their towers and cell sites make money for them based on the traffic generated through them. The tower companies generate revenues through vertical real estate, and not through voice and data volume. You will generally get a better deal when you have a carrier lease, the big 3 tower companies have to make their money on these deals, and will cut into the rents you receive. Remember, if you are considering signing a cell tower lease, your church will benefit from it long term, long after you are gone. If negotiated and structured properly, you should be able to have the opportunity to eventually extend or re-negotiate the lease in the future and get a better deal the second time around. We took a lease for a Lutheran congregation in the Carolina’s from the $400 / per month range to $1,400 and structured the lease for revenue sharing. Soon afterwards their rent increased another $600/month when a new carrier showed up (no marketing involved). The church lived with an undervalued lease for about 16 years, but now it’s structured properly for the foreseeable future. 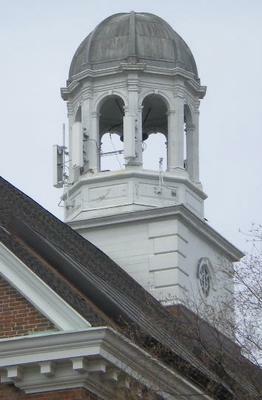 Church steeples albeit expensive to build or to retrofit and replace can be disguised to hide cellular antennas. No one would ever know they were there. Check out Larson’s website for examples of these sorts of applications. We think they make great locations for cell sites. Of course you can offer your steeple to the carrier, but often the steeple is limited to the amount of carriers that can use it. You also want to make sure that you don’t allow the carrier or developer to sublease the steeple. This is why we prefer towers to the concealed sites, as they have better prospects for future expansion and revenue generation. If it is time for a lease extension or renewal on an expiring tower lease agreement, chances are that you are no longer dealing with the original carrier, but the tower lease may have changed hands a few times and you are now dealing with a large tower management company like Crown Castle, American Tower or SBA Communications. Although this is a bit self-serving, you really need to have somebody who speaks telecom (like us) review the original lease, the tower location, and their proposal. Don’t sign their terms sheets, letter agreements, deal memo’s, perpetual easement offers, lease optimization or rent guarantee letters, no matter how urgent they seem to be without having an industry professional review them. We can’t stress this point enough times. You need to remember you’re going to battle with Goliath. It’s a good idea to make sure you have a handful of stones. Seek advice and prepare for battle. Why does your article focus on money v. health? 1)	A handful of companies are organizing to monopolize the industry. 2)	They are telling the public and our leaders this technology is safe using data from their own tests. 3)	While over 2000 independent studies have demonstrated this technology causes brain abnormalities, cognitive impairment, delayed reaction time, lack of impulse control oxidative stress, damage to mitochondria, impairs the blood brain barrier, constricts blood vessels and impairs blood flow to the brain, headaches, ringing ears, chest pain, impaired blood flow, seizures, heart failure, hearing loss, progression of neurodegenerative conditions including Alzheimer’s disease, incidences of fibrosarcoma, sarcoma, or malignant fibrous histiocytoma in the skin and the incidences of alveolar/bronchiolar adenoma or carcinoma (combined) in the lung. In addition, increased cancer risk, cellular stress, increase in harmful free radicals, genetic damages, structural and functional changes of the reproductive system, learning and memory deficits, neurological disorders, and negative impacts on general well-being in humans. Damage goes well beyond the human race, as there is growing evidence of harmful effects to both plant and animal life. 4)	The military is using almost the same frequency in their biological non-lethal weapon called Active Denial System, with Frequency 95 GHZ. This weapon is used to disperse protesters, troublemakers, prisoners and used in war. It makes people panic, shock, disperse and run away from intense heat it causes in human body. 5G range is from 24 GHz to 90 GHz. 5)	Over 20 cities and counties and growing are now fighting the FCC from rolling out this technology. 6)	The International Society of Doctors for the Environment (ISDE) and its member organizations in 27 countries, adopted a declaration calling for a moratorium on the deployment of 5G in the European Union. 7)	California, city and county governments, are opposing SB 649, an industry-sponsored bill which overrides local control over the wireless industry’s access to utility poles and public buildings for 5G deployment. 8)	Over 180 scientists and doctors from 35 countries sent a declaration to officials of the European Commission demanding a moratorium on the technology. 9)	This past August 2018, an appeal was sent to the United Nations (UN) and all member States in the world, to encourage the World Health Organization (WHO) to exert strong leadership in fostering the development of more protective EMF guidelines, encouraging precautionary measures, and educating the public about health risks, particularly risk to children and fetal development. Editor's Comment: Hello no-name shill. Thanks for the 2-star review. I've made a living doing this for over ten years honestly with hundreds of satisfied clients. My article focuses on money instead of health because I am a capitalist entrepreneur, and this is my profession of choice. I am certainly not a leftist, globalist weenie like yourself who probably still lives at home at their elderly parents in the basement. Stop feeding off the government's teet that my tax dollars pay for. Here's a question for you, globalist weenie shill... Why are you even on the internet reading this blog, you hypocrite?? Don't you know all the data centers that host the servers that power the internet are harmful to the environment, and are killing the baby seals, polar bears, owls, wolves, bees and many more of God's creatures?